Spanish scholar of the latter half of the fourteenth century. He resided in Catalonia, where he prepared his most important work, "Maggid Mishneh," a commentary on Maimonides' "Yad." This work covered the entire contents of the "Yad," but only those parts are extant which cover the following books: iii., iv., v. (ch. i.-ix. only), xi., xii. (ch. i.-iii. only), and xiii. The commentary was never published separately, but only together with the "Yad" (first at Constantinople, 1509). Vidal's second work was a commentary in Arabic on Al-Ghazali's "To'elet ha-Higgayon." This commentary was translated into Hebrew by Moses ben Joshua of Narbonne, and is extant in manuscript in the Library of the Vatican. From Joseph Caro's preface to his "Kesef Mishneh" it appears that Vidal was a personal friend of R. Nissim. 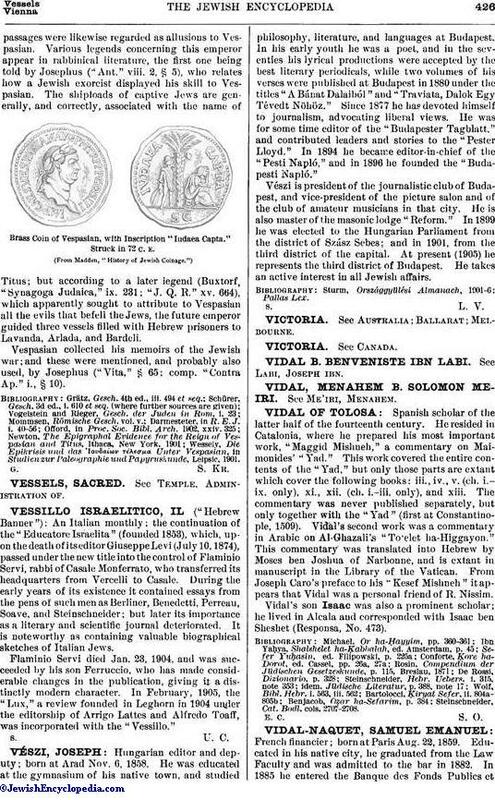 Vidal's son Isaac was also a prominent scholar; he lived in Alcala and corresponded with Isaac ben Sheshet (Responsa, No. 473). Steinschneider, Cat. Bodl. cols. 2707-2708.